The weather stayed fine for this annual event, this year held on Saturday 12 June. All the usual favourites were there: 5-a-Side Football Competition, Pole Bashing, Ducking Stool, Bouncy Castle, Mega Slide, Pinxton Puppets and Tutbury Band. There were also new stalls and attractions including miniature Land Rovers suitable for children from the age of 4 to drive! 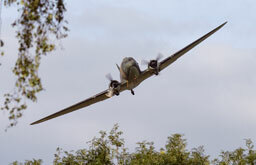 There was also a flypast from a Dakota during the afternoon, guaranteeing that it was a truly memorable day. Villagers were out in force as the sun shone on the annual carnival, held on Sunday 9 May to raise money for the village Scout group. The carnival saw a procession of decorated board game themed floats parade from The Lawns to the Scouts HQ. The best float award was won by Rolleston Pre-School, with the Beavers runners up. Other attractions included Hook a Duck, Wheel of Fortune, a bouncy castle, a bird of prey display and a funfair. The money raised will go towards the running costs of the Scout group and to help fund a trip for 20 boys, girls and Scout leaders to visit the International Scout HQ in Kandersteg, Switzerland in August. "The grand total of £10,841.95 far exceeded my expectations, so thanks a lot." Tom & Becky Starbuck. At the Annual Parish Council meeting held on Monday 19th April 2010, Mr. Dave Jennings was presented with the “Rollestonian of the year award” for 2009. Mr. Jennings offered a huge amount of support to the playbuilder project which was completed last year through the contribution of his time and loaning his plant hire equipment free of charge. Mr. Jennings contribution helped to ensure that the project was completed both on time and on budget and in turn the Parish Council was delighted to be able to recently collect the Civic Trust Award for 2009 for the project. Mr. Tom Starbuck, Mr. Andy Starbuck, Mr. John Underhill and Mr. Graham Jacks. This has been added to other donations and monies raised from gladioli sales over the summer. I was able to donate £500 to “M E RESEARCH UK” They are one of the few UK charities who raise money for research into M E/C F S This illness receives a very small level of national funding, despite there being an estimated 250,000 people in the UK affected at any one time. This particular charity became very pertinent to us since our son Craig has suffered severely from the condition for over two years. I am pleased that I was able to raise £500 for the Neonatal Surgical Ward at Birmingham Children’s Hospital where Evie Starbuck was cared for. Many thanks to you all who helped to raise this. This RODSEC Live & Local Event (supported by Staffordshire County Council, ESBC & Arts Council England) held on Sunday 21 March, 7.30pm at Rolleston Club was an intimate evening of very high quality music. Ashley Hutchings, founder of Fairport Convention and Steeleye Span and a BBC Radio 2 Folk award-winner – created this great musical partnership a few years ago. Ashley was joined by two stunning female singer songwriters (Ruth Angell and Jo Hamilton) who also play fiddle, viola and guitar and multi-talented singer and guitar player Joe Topping. In first place with 98 points was Mark Staley (Alcester). Second L & P Thompson (Rolleston) 97, third Tracey Sheppard (Poynton) 97, fourth L.Beer (Rolleston) 97 and fifth M&J Underwood (Rolleston) 96.